With more and more people relying on their smartphones and tablets, event planners are turning to apps to better engage with their attendees. One of the greatest benefits of a native app is that it does not require internet connectivity. Whether you are in an area with poor reception, in a crowded convention center with limited wifi, or using your device in "airplane mode" on your way to the event; you can still navigate the app, view information, and take advantage of its functionality. Web-based apps are limited by connectivity. What would happen if your attendees couldn’t access the internet at your event? Would they still be able to view important event information such as schedules, speaker bios, and venue maps? Native apps eliminate this concern by storing the information on your attendees’ devices. This means that they can easily access exhibitor profiles, attendee lists, and view your sponsors’ advertisements without internet connection. Most importantly, it provides your attendees with the continual and reliably fast interactive experience they demand. 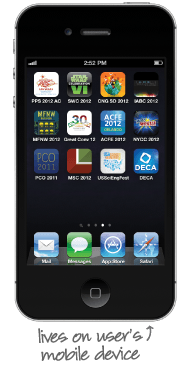 Native apps live on the user’s mobile device. There are multiple ways to direct your attendees to download the app. Use marketing campaigns. Leverage your registration process to raise awareness. 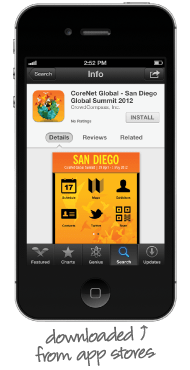 Create signage for the event with QR codes that link directly to the app store for quick download. 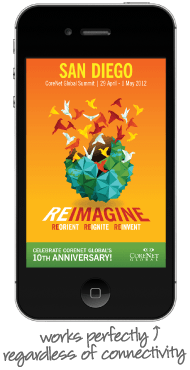 Once your attendees get the app it lives on their device and it will always be available — regardless of internet connection.